Pacific Electric no. 1036 is on a fan trip (possibly on February 12, 1950, but this image is undated), and is running on the Venice Short Line. This image was captured at Venice Boulevard and Berendo Street. 1036 happens to be parked on one of the two passing sidings on the Venice line that were located between downtown and Vineyard. The purpose of the sidings was to allow the faster Interurban trains to pass the slower local cars. Apparently the longer switch ties either weren’t removed when the line was abandoned, or they were older than the standard ties, or not treated or something. Anyhow, the location of the switches for both ends of the outbound siding on Venice Blvd. at Berendo St. have recently become clearly visible from all of the cracks in the pavement. When you look at the high quality of the street rail in this photo, you can see why the PE and LARY / LATL were allowed to abandon rail lines all over LA without having to pull up the rails and ties. Many streetcar systems in the East were required to pull up the rails and ties after abandonment because the quality of their rails were not of very good. Here in LA, about 60 to 70% of LA’s rail system sleeps just 1 or 2 inches below street pavement. Rail on the LATL’s B line along Evergreen Ave was of such high quality and in such good condition at the time of abandonment, it could have handled a Pennsy GG-1 with no problems! One place where PE rails were removed (I saw the process when I was in 6th grade) was Monrovia. Alan Weeks took photos of this nasty process–just enter “Monrovia” in the search box. In this case, the rail was in bad shape, and scrap prices were high because of the Korean War. Another place where the rails were pulled (presumably in 1951 or 52) was Sierra Madre Blvd. in downtown Sierra Madre. As late as the 1980s, one could see dips in the pavement where the ties had rotted away. One interesting thing to note on this photo and others of #1036, look closely at the car number and you will notice the background COLOR of the car is slightly darker here than the rest of the siding. Apparently when the car was repainted they did not cover up the lettering / numbers. I know there has always been discussion on the exact color of PE cars, well here it looks like we see 2 of the lator colors side by side. This looks like the car is “PE Red” and the under color is “Electric Lines #3”. Other ideas? 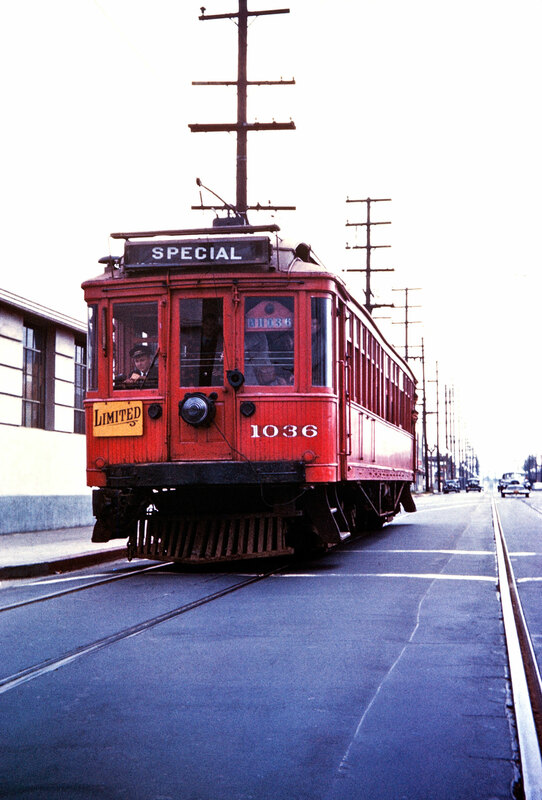 I rode the local Venice car from Crenshaw to hill st frequently in 1946. As I recall there was only one passing siding and it was on a short section of private right of way in the middle of Venice blvd.. There was a one block 3 track passing siding located between 2nd & 3rd Avenues in the center of Venice Blvd. It was known as the “2nd Ave Siding”. It could be used by trains going in either direction.